Full disclosure: I was the WORST when it came to caring for my gardening tools. 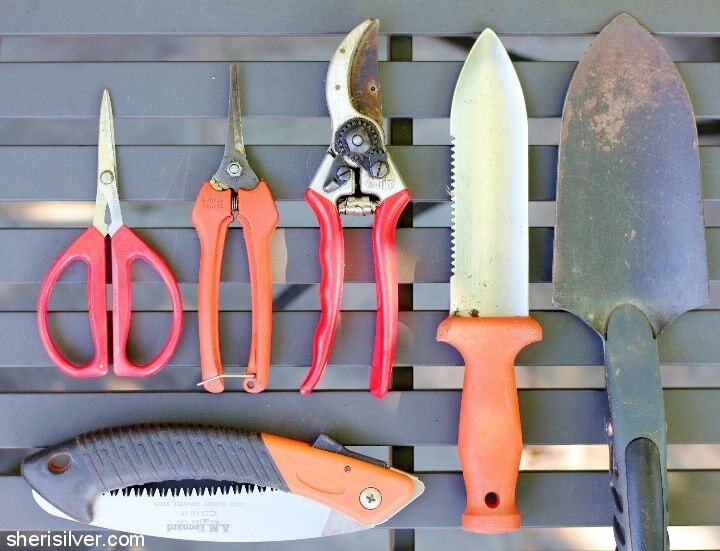 And it showed – my beautiful pruners and shears eventually turned stiff, rusty and virtually useless. When I purchased a new set a number of years ago I made a promise to myself – and my tools – to take proper care. And it’s paid off. As I’m getting ready to shut the gardens down for winter, here’s what I do with my gardening gear! Wipe or brush off all the loose dirt (a toothbrush is handy for tight spots). Use steel wool to remove any stubborn patches and/or rust. 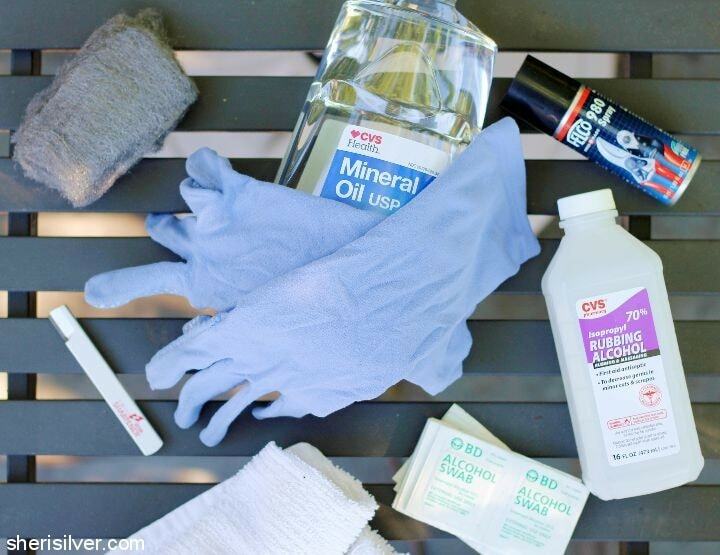 Wipe down the blades with alcohol swabs or a rag dipped in alcohol – this cleans and disinfects. Use the sharpener to sharpen all pruners, shears and scissors. Spray pruners and shears with lubricant spray – use a cloth dipped in alcohol to remove any excess from handles. Fill your containers with sand and pour some mineral oil in. Mix well; the consistency should be that of damp sand like you’d find at the beach. 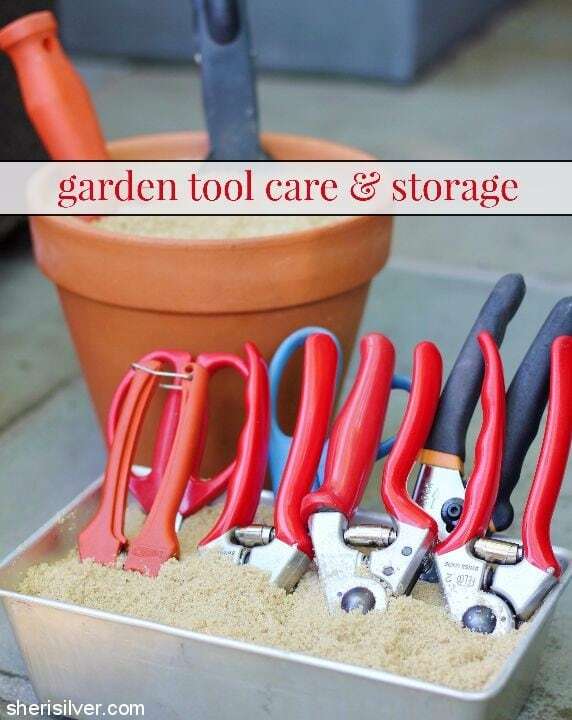 Plunge your tools in and store for the winter! While not the must fun or glamorous gardening task, it is satisfying to look at all of my clean, sharpened and oiled tools – safely stored away for winter. And it feels even better come spring, when I pull them out of storage, knowing that they’re ready to go. How about using sawdust or wood pellets or something not abrasive to the sharpened edges of the shears. I can’t imagine anything worse for edged tools than sand. Can you use vegatable oil instead of mineral oil? I found your info re caring for garden tools great, I’m a great believer in linseed oil my old grandfather used it on all of his woodworking tools. 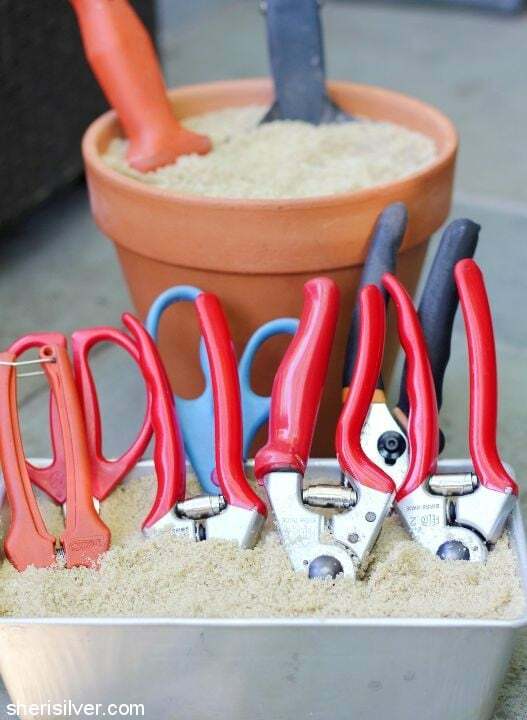 Don’t you have to clean them again in spring to remove the sand, if small grains of sand are left on pruners, etc it will blunt the cutting edges. I simply clean and oil my tools, using linseed oil on wooden handles and hang them in the shed over winter. They stay rust free and ready to use. You’re very welcome, keep up the good work! I love my gardening and my tools are my prize helpers. With carpal tunnel I take really good care of them. I am thankful for your post.